Denis's Cottage is a cosy little country cottage, located in the east of County Donegal between Killybegs and Ardara and can sleep five people. This all ground floor cottage with two double bedrooms, a single bedroom, a bathroom, a kitchen, a sitting room with dining area and woodburning stove and an external utility. Outside there is ample off road parking and a gravel area to the front with furniture and a gas barbecue. 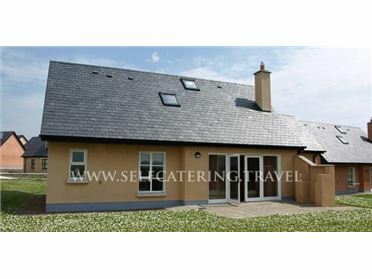 Denis's Cottage is a lovely base for your Irish holiday with many places to visit within this part of the Emerald Isle. The town of Ardara in County Donegal is situated in a wide valley where the Owentocher River enters Loughros More Bay. The town offers many craft and gift shops and traditional Irish pubs. There are walks and cycle routes in the area and every year the town hosts a walking festival. Within driving distance is Donegal Town and there are a number of sandy beaches close by. Oil central heating with woodburning stove. Gas oven and hob, microwave, fridge/freezer, washing machine in utility, dishwasher, TV with Saorview, DVD, radio, selection of books and DVDs. Fuel, power and starter pack for stove inc. in rent. Bed linen and towels inc. in rent. Travel cot on request. Ample off road parking. Front gravelled area with furniture and gas BBQ. One well-behaved dog welcome. Sorry, no smoking. Shop, pub and beach 5 miles..